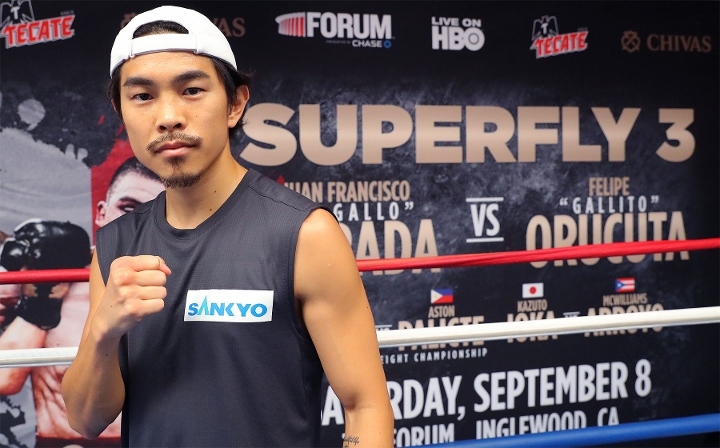 Kazuto Ioka and Aston Palicte are about to share far more in common than separate controversially scored bouts with Donnie Nietes. BoxingScene.com has learned that talks have rapidly progressed for a vacant title fight between the two, with plans to square off in late spring or early summer. An official announcement is forthcoming for Ioka and Palicte to contend for the vacant World Boxing Organization (WBO) super flyweight title. Both sides declined comment to BoxingScene.com due to ongoing discussion between camps, but remain optimistic of a deal being reached as early as by month’s end. The belt became vacant after Nietes opted to walk away from an ordered rematch with Palicte, with the two fighting to a draw in their own title fight last September. Nietes was permitted to contend for the still available belt, facing and controversially outpointing Ioka last New Year’s Eve in Macao to become a four-division titlist. Less than a month later, Palicte (25-2-1, 21KOs) punched his way right back into contention, scoring a 2nd round knockout of Jose Martinez in their title eliminator this past January. Nietes was ordered to negotiate terms for a rematch immediately thereafter, with the WBO offering just a 14-day window before ordering a purse bid. The hearing was canceled the morning of the scheduled session after Nietes informed the sanctioning body in writing his intentions to instead pursue legacy-making fights for bigger money, thus relinquishing his crown. Ioka (23-2, 13KOs)—who turned 30 on Sunday—was more than willing to answer the challenge, as the two camps continue to firm up details for their forthcoming bout. The former three-division titlist made history in his first reign, outpointing Akira Yaegashi in their thrilling June ‘12 12-round strawweight war which marked the first-ever unification bout between two defending titlist from Japan. There have been significant preliminary talks of Tanaka soon moving up in weight, with the intention of challenging Ioka for a super flyweight title in what would be a massive event in their native Japan. Another opportunity for both guys! This is the kind of fight that Im looking for.